Four years ago, when he campaigned for the office he now holds, Barack Obama described the urgent need to pursue clean energy development because of a grave and persistent problem. Demand and prices for oil were rising, along with national and economic security risks tied to ever higher imports. Supplies of domestically-produced fuel, meanwhile, were falling. Last night, as the president defined the basic outlines of an “all-out, all-of-the-above strategy that develops every available source of American energy,” the country greeted much different conditions. Domestic production of oil and natural gas is climbing rapidly. Demand is going down. Imports are steadily declining. Prices have steadied. The result is that while President Obama is still pressing for more sources of cleaner energy — “I’m directing my administration to allow the development of clean energy on enough public land to power 3 million homes,” he said — the allure of pursuing them is not nearly so keen. Summed up, the surge in fossil fuel production has indeed produced an economic reprieve, but one that is exceedingly risky for land and water, and could well turn out to be a surrender to the future. Horizontal drilling technology coupled with high-pressure water blasting — much of it developed with the help of federal research grants — has opened deep beds of hydrocarbon-rich shales all over the country to gas and oil production. An energy boom has erupted in eight Great Plains states, three mid-Atlantic states, plus Louisiana and California. In 2011, according to the Energy Information Administration, production of natural gas from deep shales reached 630 billion cubic feet a month, a third of the total U.S. natural gas production and 17 times more than in 2000. U.S. oil production last year reached almost 6 million barrels a day, and has been rising for three straight years, the first time that has happened since the 1970s. The boom is generating tens of thousands of new jobs in politically strategic places like Ohio, Pennsylvania, and Colorado that are essential to the president’s re-election chances. Since 2005, according to EMSI, an Idaho-based labor market research firm, oil and gas production activities alone generated almost 200,000 new jobs nationally. Nearly 400,000 other jobs in transportation, manufacturing, service, and related support sectors also were created, said EMSI. The other side of the president’s plan — building a bridge to a new era of cleaner energy sources — is unfolding at a much slower pace. Last year, according to the American Wind Energy Association, almost 7,000 megawatts of wind energy capacity was constructed in the U.S., 31 percent more than in 2010. But China built more than 14,000 megawatts of wind energy, or twice as much. It takes big and consistent federal and state investment in wind, solar, cellulosic biofuels, geothermal energy, nuclear energy, clean cars and trucks, trains, and energy-efficient buildings to give innovators and entrepreneurs a solid grip in the cleaner economy. In the era of deficit and disinvestment that describes the political conditions at work in Washington and most state capitals, lawmakers supported by the fossil fuel sector have expressed no enthusiasm for making those investments. The arguments for pursuing wind, solar, and other cleaner sources of energy make a lot of sense, as do reasons for being more cautious about the consequences of oil and gas production. The use of water is a good starting point. 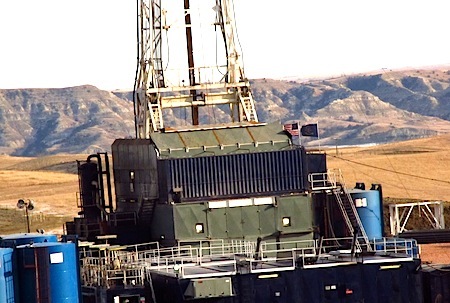 Much of the shale gas and shale oil development is occurring on the arid Great Plains, where drillers require 2 million to 5 million gallons of water to hydrofracture each well. In a region where competition for water is fierce, water managers are not sure where the supply for thousands of new wells a year will come from. In addition, much of the water that goes down each well has to be brought back to the surface and disposed safely because it contains chemical contaminants. States are only now considering requirements for wastewater disposal from shale oil and shale gas fields. Contrast that with generating power from solar photovoltaic and wind energy installations, which require, essentially, no water to operate. Or generating fuel from switch grass and other sources of plant-based fuel that can be grown on marginal lands and don’t need to be irrigated. Big clean energy projects, though, are proceeding fitfully. Because of the surge in domestic oil and gas production, they face mounting price competition in energy markets. And they are confronting serious opposition at the grassroots across the country. My colleague at Circle of Blue, Brett Walton, is reporting later this week on one fight over constructing solar plants in Colorado’s San Luis Valley, which is identified by the Obama administration as one of the 17 most favorable places in the U.S. to develop solar energy. In effect, the fossil fuel reprieve could easily turn out to be a devastating surrender to the future. Researchers at the Massachusetts Institute of Technology, who evaluated the effects of rising shale gas production on clean energy innovation, reached much the same conclusion in a report earlier this month. “People speak of [natural] gas as a bridge to the future, but there had better be something at the other end of the bridge,” said Henry Jacoby, co-director emeritus of MIT’s Joint Program on the Science and Policy of Global Change, and co-author the MIT Energy Initiative’s The Future of Natural Gas.